The area's culture and art galleries are just a few of the reasons to vacation in Leverkusen. This city's gardens, parks and football games draw many visitors. Cologne Cathedral and Romano-Germanic Museum are just a couple of the must-sees in the area. Whether you're planning a family vacation, friends trip or romantic retreat, HomeAway has a great selection of vacation homes. Many rentals come with a full kitchen and separate dining area, perfect if you need a space for entertaining. The nearest airport is in Cologne (CGN-Cologne - Bonn), located 11.7 mi (18.8 km) from the city center. If you can't find a flight that works for your travel itinerary, you might consider flying into Duesseldorf (DUS-Duesseldorf Intl. ), which is 19.3 mi (31.1 km) away. If you prefer to travel by train, Leverkusen Mitte Station, Leverkusen-Schlebusch Station and Leverkusen Opladen Station are the main stations that serve the city. You can get around Leverkusen by catching a ride on the metro at Leverkusen-Küppersteg S-Bahn, Leverkusen-Rheindorf S-Bahn or Schlebusch U-Bahn. Where to stay around Leverkusen? Our 2019 accommodation listings offer a large selection of 473 holiday lettings near Leverkusen. From 422 Condos/Apartments to 36 Houses, find unique self catering accommodation for you to enjoy a memorable holiday or a weekend with your family and friends. The best place to stay near Leverkusen is on HomeAway. 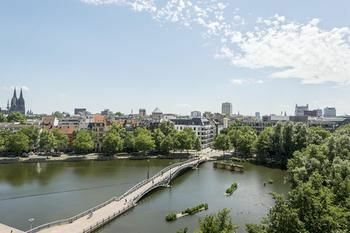 Can I rent Condos/Apartments in Leverkusen? Can I find a holiday accommodation with pool in Leverkusen? Yes, you can select your preferred holiday accommodation with pool among our 11 holiday homes with pool available in Leverkusen. Please use our search bar to access the selection of holiday rentals available.